There will be only one (last) round of the Regular Season in Liga Nacional. There were many interesting games last round. The round ended with defeat of the leader and favorites losing the games. Here is the last round review presented by ESL. Top ranked Las Animas (16-6) recorded its sixth loss in Valdivia on Sunday night. Hosts were edged by second ranked Los Leones (15-8) 75-72. It may be a crucial game in the contest for the top position in the league. The best player for the winners was Dominican power forward Manuel Guzman (204-82, college: Bemidji St.) who had a double-double by scoring 19 points, 14 rebounds and 4 assists. American point guard Scott Rodgers (191-87, college: Drexel) chipped in 19 points, 7 rebounds and 4 assists. American center Arkeem Joseph (206-94, college: Texas A&M Int.) produced a double-double by scoring 24 points and 15 rebounds for the hosts. Los Leones have an impressive seven-game winning streak. They maintain second position with 15-8 record behind leader Temuco, which they share with CD Valdivia. Las Animas at the other side still keep top place with six games lost. Los Leones is looking forward to face Puente Alto (#4) at home in the next round. Las Animas' supporters also look forward to an exciting derby game next round, where their team will travel locally in Valdivia to the arena Deportivo Valdivia. Important game to mention about took place in Ancud. Second ranked Deportivo Valdivia (15-8) saved a 3-point victory on the road edging 4th ranked AB Ancud (11-12) 93-90 on Sunday evening. American forward Khapri Alston (196-94, college: Midwestern St.) orchestrated the victory with a double-double by scoring 32 points and 15 rebounds. Claudio Naranjo contributed with 22 points and 5 rebounds for the winners. International guard Sebastian Suarez (193-91, college: Portland St.) replied with 36 points (!!!) and 8 rebounds (was perfect 10-for-10 from the free throw line !!!) for AB Ancud. Deportivo Valdivia maintains second position with 15-8 record behind leader Temuco, which they share with Los Leones. AB Ancud lost third consecutive game. They keep the fourth place with 12 games lost. They share the position with Puente Alto. Deportivo Valdivia's supporters look forward to an exciting derby game next round, where their team will face at home their local rival from Valdivia Las Animas. Very important is a road loss of third ranked Aleman (13-11) against fifth ranked CD Castro (12-11) on Sunday night. Visiting Aleman was defeated by CD Castro in a tough game in Castro 69-77. It ended at the same time the two-game winning streak of Aleman. Worth to mention a great performance of Winsome Frazier who helped to win the game recording 23 points, 6 rebounds, 5 assists and 7 steals. Alejandro Vergara responded with a double-double by scoring 20 points, 12 rebounds and 8 assists. CD Castro have a solid three-game winning streak. They moved-up to fourth place. Loser Aleman keeps the third position with 11 games lost. CD Castro will meet at home league's leader Temuco in the next round and it may be the game of the week. Aleman will play against Osorno Basquetbol and hope to secure a win. Very important is a road loss of second ranked Deportivo Valdivia (15-8) against fifth ranked CD Castro (12-11) on Saturday night. Visiting Deportivo Valdivia was defeated by CD Castro in a tough game in Castro 73-78. The winners were led by Manny Suarez who had that evening a double-double by scoring 12 points, 14 rebounds and 4 assists. CD Castro have a solid three-game winning streak. They moved-up to fourth place. Deportivo Valdivia at the other side keeps the second position with eight games lost. CD Castro's next round opponent will be league's leader Temuco at home and it may be the game of the week. Deportivo Valdivia's supporters look forward to an exciting derby game next round, where their team will face at home their local rival from Valdivia Las Animas. An exciting game between Top Four teams was played in Concepcion. Third ranked Universidad de Concepcion faced one of their biggest challengers Puente Alto. Host Universidad de Concepcion (13-10) smashed guests from Puente Alto (11-12) 96-70. The best player for the winners was Anthony Kent who had a double-double by scoring 28 points and 10 rebounds. The winner was already known earlier in the game, so both coaches allowed to play the bench players saving starting five for next games. Universidad de Concepcion maintains third position with 13-10 record having just two points less than leader Temuco. Loser Puente Alto keeps the fourth place with 12 games lost. Universidad de Concepcion will face AB Ancud (#5) on the road in the next round. Puente Alto will play against the league's second-placed Los Leones in Quilpue and it may be a tough game between close rivals. CDU Catolica was defeated by Osorno in a road game 80-73. AB Ancud was beaten by Puerto Varas at home 68-77. Puente Alto was destroyed by Temuco on the opponent's court 103-82. Osorno unfortunately lost to Los Leones in a home game 89-105. CDE Esp. Talca recorded a loss to CDU Concepcion on the road 72-83. Las Animas crushed CDU Catolica on its own court 108-71. CDE Esp. Talca was beaten by Temuco in a road game 99-81. The best stats of 20th round was 34 points (!!! 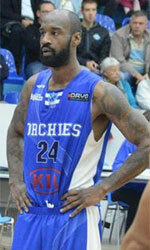 ), 18 rebounds and 6 assists by TJ Robinson of Temuco. There was a minor upset when their close opponent Universidad Catolica (1-22) was defeated on the road by sixth ranked Osorno Basquetbol (9-15) 80-73 on Sunday. Osorno Basquetbol outrebounded Universidad Catolica 47-34 including a 37-25 advantage in defensive rebounds. Universidad Catolica was plagued by 25 personal fouls down the stretch. The best player for the winners was American forward Terrence Shannon (203-79, college: Elgin CC) who had a double-double by scoring 21 points and 13 rebounds. International forward Juan Fontena (196-87) chipped in a double-double by scoring 14 points and 10 rebounds. American forward Gary Johnson (198-88, college: Texas) produced 23 points and 7 rebounds and his fellow American import guard Malik Morgan (193-94, college: Tulane) added 14 points and 10 rebounds respectively for the guests. Four Universidad Catolica players scored in double figures. Osorno Basquetbol maintains sixth position with 9-15 record which they share with defeated Universidad Catolica. Universidad Catolica lost ninth consecutive game. They keep the sixth place with 22 games lost. Osorno Basquetbol will face higher ranked Aleman (#3) in Puerto Varas in the next round and it may be quite challenging game. Top ranked Las Animas (16-6) recorded its sixth loss in Valdivia on Sunday night. Hosts were edged by second ranked Los Leones (15-8) 75-72. It may be a crucial game in the contest for the top position in the league. The best player for the winners was Dominican power forward Manuel Guzman (204-82, college: Bemidji St.) who had a double-double by scoring 19 points, 14 rebounds and 4 assists. American point guard Scott Rodgers (191-87, college: Drexel) chipped in 19 points, 7 rebounds and 4 assists. Four Los Leones players scored in double figures. American center Arkeem Joseph (206-94, college: Texas A&M Int.) produced a double-double by scoring 24 points and 15 rebounds and his fellow American import forward Arnold Louis (201-90, college: Savannah St., agency: HMS) added 17 points, 10 rebounds and 5 assists respectively for the hosts. Los Leones have an impressive seven-game winning streak. They maintain second position with 15-8 record behind leader Temuco, which they share with CD Valdivia. Las Animas at the other side still keep top place with six games lost. Los Leones is looking forward to face Puente Alto (#4) at home in the next round. Las Animas' supporters also look forward to an exciting derby game next round, where their team will travel locally in Valdivia to the arena Deportivo Valdivia. An exciting game between Top Four teams was played in Concepcion. Third ranked Universidad de Concepcion faced one of their biggest challengers Puente Alto. Host Universidad de Concepcion (13-10) smashed guests from Puente Alto (11-12) 96-70. Universidad de Concepcion dominated down low during the game scoring 64 of its points in the paint compared to Puente Alto's 24. They outrebounded Puente Alto 36-22 including 29 on the defensive glass. Universidad de Concepcion looked well-organized offensively handing out 21 assists. The best player for the winners was American power forward Anthony Kent (208-83, college: Ball St.) who had a double-double by scoring 28 points and 10 rebounds. International guard Diego Silva (186-93) chipped in 18 points and 5 rebounds. American Rakim Brown (198-91, college: Humboldt St.) produced 15 points and 6 rebounds and his fellow American import forward Jerome Hill (198-94, college: Gardner-Webb, agency: Interperformances) added 15 points respectively for the guests. Both teams had four players each who scored in double figures. The winner was already known earlier in the game, so both coaches allowed to play the bench players saving starting five for next games. Universidad de Concepcion maintains third position with 13-10 record having just two points less than leader Temuco. Loser Puente Alto keeps the fourth place with 12 games lost. Universidad de Concepcion will face AB Ancud (#5) on the road in the next round. Puente Alto will play against the league's second-placed Los Leones in Quilpue and it may be a tough game between close rivals. Important game to mention about took place in Ancud. Second ranked Deportivo Valdivia (15-8) saved a 3-point victory on the road edging 4th ranked AB Ancud (11-12) 93-90 on Sunday evening. AB Ancud was plagued by 28 personal fouls down the stretch. American forward Khapri Alston (196-94, college: Midwestern St.) orchestrated the victory with a double-double by scoring 32 points and 15 rebounds. The former international forward Claudio Naranjo (191-87) contributed with 22 points and 5 rebounds for the winners. Four Deportivo Valdivia players scored in double figures. International guard Sebastian Suarez (193-91, college: Portland St.) replied with 36 points (!!!) and 8 rebounds (was perfect 10-for-10 from the free throw line !!!) and American guard Jesse Hardin (188-93, college: Walsh) added 24 points (was perfect 7-for-7 from the free throw line) in the effort for AB Ancud. Deportivo Valdivia maintains second position with 15-8 record behind leader Temuco, which they share with Los Leones. AB Ancud lost third consecutive game. They keep the fourth place with 12 games lost. They share the position with Puente Alto. Deportivo Valdivia's supporters look forward to an exciting derby game next round, where their team will face at home their local rival from Valdivia Las Animas. Very important is a road loss of third ranked Aleman (13-11) against fifth ranked CD Castro (12-11) on Sunday night. Visiting Aleman was defeated by CD Castro in a tough game in Castro 69-77. It ended at the same time the two-game winning streak of Aleman. CD Castro shot 18 for 24 from the free-throw line, while Aleman only scored one point from the stripe. CD Castro forced 21 Aleman turnovers. Strangely Aleman outrebounded CD Castro 44-30 including 30 on the defensive glass. Worth to mention a great performance of American guard Winsome Frazier (193-82, college: Mississippi St., agency: Interperformances) who helped to win the game recording 23 points, 6 rebounds, 5 assists and 7 steals and the other American import forward Trayvion Leonard (205-93, college: Barry) who added 19 points and 7 rebounds during the contest. Four CD Castro players scored in double figures. Spanish Alejandro Vergara (196-95) responded with a double-double by scoring 20 points, 12 rebounds and 8 assists and American-Nigerian Ikenna Mbamalu (191-91, college: La-Lafayette) scored 24 points and 6 rebounds. CD Castro have a solid three-game winning streak. They moved-up to fourth place. Loser Aleman keeps the third position with 11 games lost. CD Castro will meet at home league's leader Temuco in the next round and it may be the game of the week. Aleman will play against Osorno Basquetbol and hope to secure a win. The game between closely ranked teams ended with third ranked Aleman's (13-11) road victory over one of their biggest challengers AB Ancud (11-12) 77-68 on Saturday. The best player for the winners was Colombian-Venezuelan center Luis Julio (201-80) who scored 24 points and 8 rebounds. American-Nigerian Ikenna Mbamalu (191-91, college: La-Lafayette) chipped in 22 points and 7 rebounds. Aleman's coach used a ten-player rotation which allowed the starters a little rest for the next games. American power forward Kwame Alexander (201-90, college: CS San Bernar.) produced a double-double by scoring 19 points and 20 rebounds and international guard Sebastian Suarez (193-91, college: Portland St.) added 16 points and 5 rebounds respectively for the hosts. Aleman maintains third position with 13-11 record having just one point less than leader Temuco. AB Ancud lost third consecutive game. They keep the fourth place with 12 games lost. Aleman will face Osorno Basquetbol (#6) at home in the next round. AB Ancud will play against Universidad de Concepcion and it may be a tough game between close rivals. Rather expected game when 4th ranked Puente Alto (11-12) was rolled over on the road by first ranked Temuco (17-8) 103-82 on Saturday. Temuco looked well-organized offensively handing out 28 assists. The game was dominated by American players. The best player for the winners was forward TJ Robinson (203-89, college: Long Beach St.) who had a double-double by scoring 23 points, 12 rebounds and 4 assists. Swingman Jovonni Shuler (195-87, college: Savannah St.) chipped in 21 points, 7 rebounds and 6 assists. Shuler is a former Eurobasket Summer League player, which is considered top international summer league in the market. Four Temuco players scored in double figures. Rakim Brown (198-91, college: Humboldt St.) produced 28 points and 5 rebounds and forward Reggie Larry (198-86, college: Boise St., agency: Pro Sports) added 15 points and 9 rebounds respectively for the guests. Since the result was very predictable, it gave the chance for the coaches to test many bench players which allowed the starters a little rest for the next games. Newly promoted Temuco maintains first position with 17-8 record. Loser Puente Alto keeps the fourth place with 12 games lost. Temuco will face CD Castro (#4) on the road in the next round. Puente Alto will play against the league's second-placed Los Leones in Quilpue and it may be a tough game between close rivals. Rather predictable result when second ranked Los Leones (15-8) beat on the road 6th ranked Osorno Basquetbol (9-15) 105-89 on Saturday. They outrebounded Osorno Basquetbol 45-29 including a 36-25 advantage in defensive rebounds. Los Leones looked well-organized offensively handing out 24 assists. The best player for the winners was Dominican power forward Manuel Guzman (204-82, college: Bemidji St.) who had a double-double by scoring 25 points, 14 rebounds and 4 assists (on 12-of-15 shooting from the field). American point guard Scott Rodgers (191-87, college: Drexel) chipped in a double-double by scoring 25 points and 11 assists. Brazilian center Dida Pereira (202-92, college: Sequoias CC) produced a double-double by scoring 15 points and 12 rebounds and American-Puerto Rican Wil Martinez (188-92, college: Fairmont St.) added 23 points respectively for the hosts. Both teams had four players each who scored in double figures. Los Leones have an impressive seven-game winning streak. They maintain second position with 15-8 record behind leader Temuco, which they share with CD Valdivia. Loser Osorno Basquetbol keeps the sixth place with 15 games lost. Los Leones will face Puente Alto (#4) at home in the next round. Osorno Basquetbol will play against Aleman in Puerto Varas and hope to win that game. Not a big story in a game when 5th ranked Espanol de Talca (6-16) was defeated on the road by third ranked Universidad de Concepcion (13-10) 83-72 on Saturday. Universidad de Concepcion outrebounded Espanol de Talca 43-26 including a 34-22 advantage in defensive rebounds. They looked well-organized offensively handing out 21 assists. The game was dominated by American players. The best player for the winners was guard Kyle Lamonte (191-84, college: William Carey) who scored 20 points and 6 assists. Power forward Anthony Kent (208-83, college: Ball St.) chipped in 18 points and 9 rebounds. Lamonte is a former Eurobasket Summer League player, which is considered top summer league for players who want to play basketball overseas. Four Universidad de Concepcion players scored in double figures. Forward Jamelle Cornley (196-87, college: Penn St.) produced 23 points and 6 rebounds and forward Elijah Macon (206-93, college: W.Virginia) added 17 points and 10 rebounds respectively for the guests. Universidad de Concepcion maintains third position with 13-10 record having just two points less than leader Temuco. Espanol de Talca lost fifth consecutive game. They keep the fifth place with 16 games lost. Universidad de Concepcion will face AB Ancud (#5) on the road in the next round. Espanol de Talca will play against Universidad Catolica in Santiago and it may be a tough game between close rivals. Everything went according to plan in Valdivia where first ranked Las Animas (16-6) outleveled 6th ranked Universidad Catolica (1-22) 108-71 on Saturday. Las Animas dominated down low during the game scoring 58 of its points in the paint compared to Universidad Catolica's 26 and had 26 for 36 from the free-throw line, while Universidad Catolica only scored nine points from the stripe. They outrebounded Universidad Catolica 51-37 including a 42-27 advantage in defensive rebounds. Las Animas looked well-organized offensively handing out 27 assists. Universidad Catolica was plagued by 26 personal fouls down the stretch. The game was dominated by American players. The best player for the winners was center Arkeem Joseph (206-94, college: Texas A&M Int.) who had a double-double by scoring 25 points and 14 rebounds. Forward Arnold Louis (201-90, college: Savannah St., agency: HMS) chipped in 23 points and 8 rebounds. Four Las Animas players scored in double figures. Joe Efese (198-90, college: Cent.Conn.St.) produced a double-double by scoring 19 points and 11 rebounds and forward Gary Johnson (198-88, college: Texas) added 12 points and 7 rebounds respectively for the guests. Since the result was very predictable, it gave the chance for the coaches to test many bench players which allowed the starters a little rest for the next games. Las Animas maintains first position with 16-6 record. Universidad Catolica lost ninth consecutive game. They keep the sixth place with 22 games lost. Las Animas' supporters look forward to an exciting derby game next round, where their team will travel locally in Valdivia to the arena Deportivo Valdivia. Very important is a road loss of second ranked Deportivo Valdivia (15-8) against fifth ranked CD Castro (12-11) on Saturday night. Visiting Deportivo Valdivia was defeated by CD Castro in a tough game in Castro 73-78. The winners were led by international center Manny Suarez (208-93, college: Creighton) who had that evening a double-double by scoring 12 points, 14 rebounds and 4 assists and American forward Trayvion Leonard (205-93, college: Barry) supported him with 22 points and 5 rebounds. Even a double-double of 17 points and 21 rebounds by American forward Khapri Alston (196-94, college: Midwestern St.) did not help to save the game for Deportivo Valdivia. 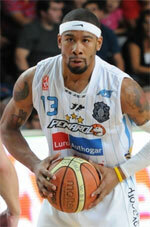 His fellow American import Tracy Robinson (201-86, college: Loyola, IL) added 21 points and 5 rebounds for the guests. Both teams had four players each who scored in double figures. CD Castro have a solid three-game winning streak. They moved-up to fourth place. Deportivo Valdivia at the other side keeps the second position with eight games lost. CD Castro's next round opponent will be league's leader Temuco at home and it may be the game of the week. Deportivo Valdivia's supporters look forward to an exciting derby game next round, where their team will face at home their local rival from Valdivia Las Animas. There was no surprise when 5th ranked Espanol de Talca (6-16) was defeated on the road by first ranked Temuco (17-8) 99-81 on Sunday. Temuco outrebounded Espanol de Talca 50-35 including 35 on the defensive glass. They looked well-organized offensively handing out 25 assists. The best player for the winners was American forward TJ Robinson (203-89, college: Long Beach St.) who had a double-double by scoring 34 points (!!! ), 18 rebounds and 6 assists. The other American import forward Abiodun Adegoke (203-91, college: Midwestern St.) chipped in a double-double by scoring 12 points and 11 rebounds. Four Temuco players scored in double figures. Temuco's coach used entire bench which allowed the starters a little rest for the next games. David Gonzalez (180-86) produced 25 points and 4 assists and American forward Elijah Macon (206-93, college: W.Virginia) added 21 points and 8 rebounds respectively for the guests. Newly promoted Temuco maintains first position with 17-8 record. Espanol de Talca lost fifth consecutive game. They keep the fifth place with 16 games lost. Temuco will face CD Castro (#4) on the road in the next round. Espanol de Talca will play against Universidad Catolica in Santiago and it may be a tough game between close rivals.